Faurecia SA supplies the new Seat Alhambra with a sportier, lower-positioned driver's seat that provides 16mm of additional headroom compared with the first-generation of the large minivan. The French partsmaker is responsible for the Alhambra's complete seats, including the frames, tracks, adjustment mechanisms and foam interiors. Faurecia also contributes the Alhambra's instrument panel and center console. The minivan's front seats may be fitted with heating elements while the second-row seats have anchor points for ISOFIX child seats. Another key feature is the ability to fold the seats into the floor, which boosts cargo space to 2,430 liters. 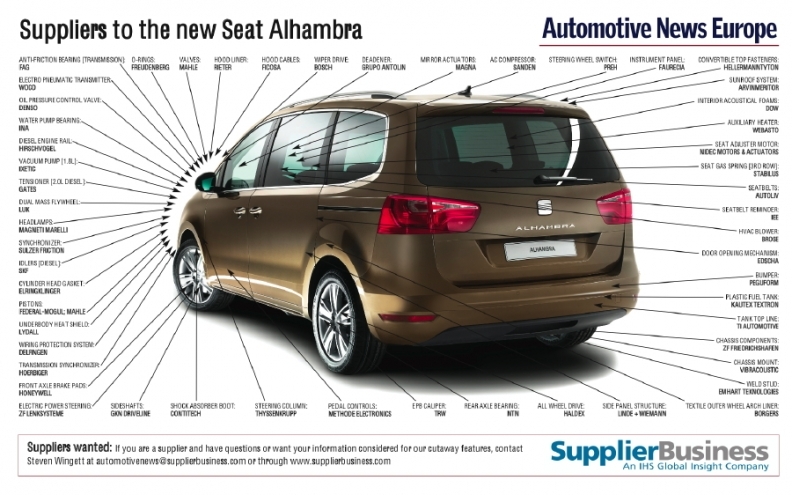 All of the Alhambra's seats are equipped with three-point automatic seat belts from Autoliv Inc. Meanwhile, TRW Automotive contributes the seat belt buckles. The Alhambra also has a standard-fit seat belt reminder from IEE SA. Other noteworthy suppliers include Rieter Automotive AG, which supplies its temperature-stable thermo-acoustic absorber – Theta-Cell – for the engine bay. Rieter claims that the product is up to 60 percent lighter than conventional alternatives. Rieter supplies the absorbent material from its factory, in Setubal, Portugal, which is the same town where the Alhambra and its platform mate, the Volkswagen Sharan, are produced. ZF Lenksysteme GmbH contributes the electric power steering and Brose Fahrzeugteile GmbH & Co. KG supplies the tailgate closing system. The new Alhambra is 4850mm long by 1900mm wide, making it 220mm longer and 90mm wider than its predecessor, but it weighs dozens of kilograms less (exact figures vary depending on engine choice and other options). It came to market in two trim levels and with a choice of two diesel and two gasoline units, but despite being more powerful than those of the previous generation they are up to 16 percent more fuel efficient. The VW Group intends to make 27,000 Alhambras and 50,000 Sharans a year. Alhambra prices start at 30,300 euros (about $42,220) in Spain.